With all the travel time I had, I was able to finish up a pair of socks and was about 10 rows away from finishing Springtime Bandit when I arrived home on Monday. Friday, on the bus to NYC, I finished up my stripey socks. I started back on them Thursday, about halfway done with the foot, and by the time I’d landed in DC, I’d already finished the heel. Next thing I knew, they were done! Notes: I used my own pattern. 64 stitch sock with round toe and short row heel – my “standard” for plain vanilla socks for myself. These seemed to take so long because I kept putting them aside for other projects, but I’m happy I’ve finally finished them and can add them to my growing collection of Vesper socks! I started Springtime Bandit on Tuesday last week and after I finished the Open Flame socks, I picked it back up. I worked on it non-stop over the weekend. I had decided to change the needle size to a US 6 (pattern says US 8) because the yarn I chose wasn’t worsted weight and I thought it looked too loose on US 8’s, so I knew it would probably end up smaller. Since it was looking like I’d have yarn left over, I decided to add an extra repeat in the body chart to give it a little more length. Even with that, I have about a skein and 1/3 left! Probably could have added more repeats, but I think it ended up big enough, even pre-blocking. I’ll be washing and blocking this either tonight or tomorrow. 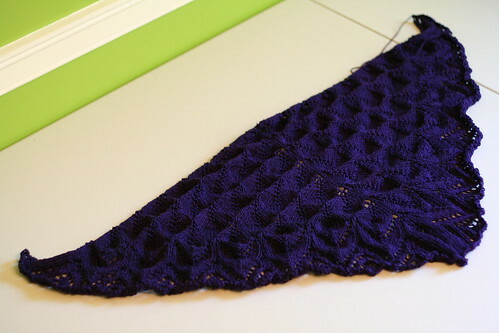 Unstretched, it measures 37 inches across and 18 inches from the center top of the shawl to the center point. Pretty decent size without blocking! I used Tilli Thomas Pile for this, which is 100% silk. I’m anxious to see how much it grows with blocking. The Shetland Triangle I made with 100% silk ended up growing quite a bit, so I’m sure this will, too. Now that some of my projects are off the needles and I’m working on mostly small things, I don’t find myself super excited about any of them. I think it’s post-big-project syndrome. I’ve finished Starlight (which still needs FO shots), which felt like the Epic Sweater That Would Never Be Done, so without any nagging project needing to be done, I feel rather blah about what I’m currently working on. I’ve gone back to the Sooper Seekrit Project for my TLE swap pal, which is gaining my interest again. Half thought about ripping out the Snapdragon Flip-Tops and iPhone Mitts, but I’d still like to finish them, so I haven’t yet. I think I just need some time to recover from finishing things before starting anything big again. I’ve already got my eye on a few sweater patterns, though I’d like to finish some of the smaller things I’m working on before casting on just yet! Ever feel kinda blah about things you’re working on after finishing a big project? What helps you to get your knitting mojo/excitement back? I like starting a new, small project that will help me learn something new. Right now I’m working on the Inga hat to practice my colorwork skills. Those socks are really cute! Can’t wait to see the lace in all its blocked glory. 🙂 Rhinebeck always goes way too fast it seems.